My Savannah Pullover appears in the new Knitscene Spring 2018. It's worked in Berroco Elba, which happens to be the yarn I suggested (doesn't always work that way! ), and which I absolutely love-- it's a cotton tape yarn, and the construction gives it a light, airy feel, quite different from a typical plied cotton yarn. The colors are also lovely-- shades range from pale to saturated, but all with a nice heathery finish. As you can see I did not go to school for fashion sketching, although I do think the sketch conveys the essential features: wide scooped neck, raglan 3/4 length sleeves, cropped length, and lace detailing. And I was really smitten by the lace pattern (the idea was to to use the mirror image for the other side of the pullover). And here is a photo of the pullover on Ofelia, my mannequin-- just to make clear that it can be worn on both shoulders. Well, for this pullover, I got all the way to the bottom ribbing, and realized that, although I should have had an even number of stitches between the two lace panels, I had an odd number. This was actually a good thing, because the hem stitch pattern is a 1X1 rib, so it was better to have an odd number of stitches, allowing the front to be centered on a rib. Especially since the lace flows so nicely into the ribbing. I must have placed one of the side markers one stitch off-- oops! I didn't have the time to reknit the entire pullover from the armholes, so I went ahead and finished it. But I realized that if I had placed the markers correctly, I would have had to decrease a stitch in the center front and back at the beginning of the ribbing, so the rib would be centered. Having to do a decrease was an inelegant solution (compared to just starting out with an odd number of stitches!) that I didn't want to pass on to other knitters, so when I wrote up the pattern, I wrote it so that all of the sizes have an odd number of stitches front and back, BEFORE starting the lace. 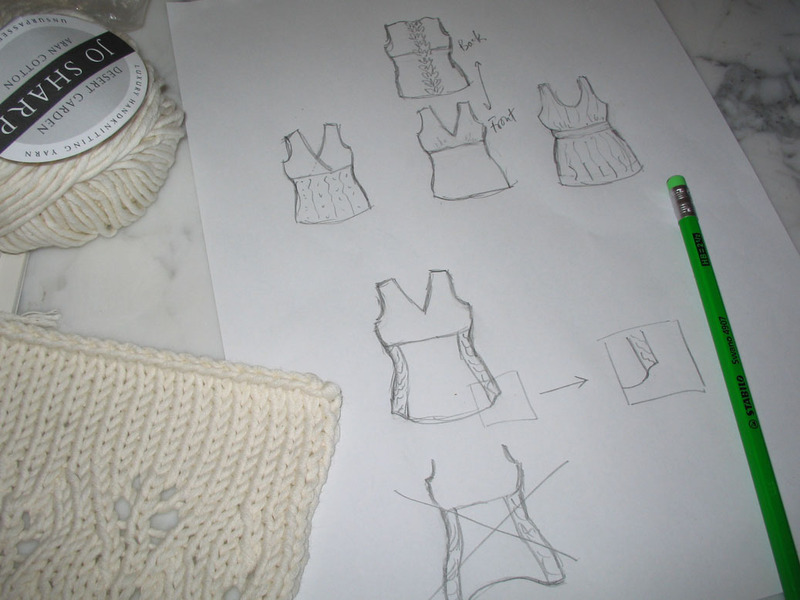 I also added a note to the Knitscene editors explaining what had happened, because editors don't like having pattern instructions that don't match the sample (and rightly so!). But I felt that in this case, the difference in the sample was minor, and luckily for me, the editors agreed. So if you are thinking that the lace panels seem to be skewed a bit, well the fact is that with a large gauge, even one stitch off can make a difference (and I think the model photos were styled to make a slight asymmetry appear purposeful). But fear not: if you make your own Savannah, the lace panels will be centered properly! 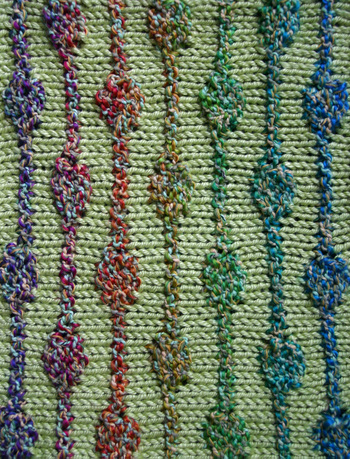 There is only one stitch pattern (so far*) that I've used more than once in my designs, and it is the "Seaweed" pattern from Barbara Walker's 2nd Treasury of Knitting Patterns. It is by no means the most striking stitch pattern I've seen, but it is unusual, and it has a quiet elegance that I find very attractive. I first used it in the Seaside Gloves pattern, originally published in Magknits and now available here. The stitch pattern is both a texture and a rib pattern, which works well for gloves, giving them a nice fit as well surface interest (and I also added beads). But in looking at photos of the gloves, I realized that I like them best when they are not being worn: the Seaweed pattern is really at its best unstretched, accentuating the subtle wavy ribs and background texture. That is why I really like the way the Seaweed Vest was photographed forBrave New Knits: it is worn with several inches of ease and accessorized with a belt, which allows the fabric to contract slightly and emphazise the narrow wavy ribs. In keeping with the narrow ribs, I decided to use an attached I-cord to trim the neck edge and armholes, and allow the Seaweed pattern itself to form the bottom edge. The front neckline is quite deep, and the back neckline more shallow (but the vest can also be worn with the shallow neckline in front, as seen in the last photo). 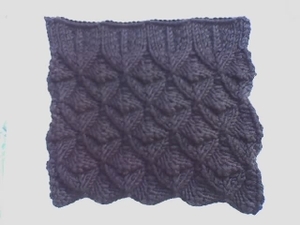 This pattern is quite simply constructed compared to many of my designs, and probably suited for a careful novice knitter (because on certain rows, it does take a bit of concentration to keep track of where you are in the stitch pattern). *There are other stitch patterns that I've used in a design and would happily use again (just haven't gotten around to it yet!). I love Hearts of Oak (Selva Skirt), Chinese Lace (Chinese Lace pullover), Four Sisters (Sorelle pullover), and the stitch pattern showcased in the Plaited Tam, and I do not feel I've exhausted the design possibilities of any of these. I've never been a sock knitter; my small projects of preference are hats and baby knits. And fall, of course, is a fine time to think about hat knitting (and thus for designers, a fine time to think about creating some hat patterns). I had noted the stitch pattern at left (from the Japanese book Knitting Patterns Book 250) back in the spring, and it struck me as something that could be adapted into an interesting hat. I went so far as to work on adapting the leaf motif to fit within the limited number of rows possible on a hat (deciding on a sport weight yarn to get a few more rows in) and charting the crown decreases, and then shelved that project over the summer to work on other things. Non sono stata mai una maglierista dei calzini; i miei progetti piccoli preferiti sono i cappelli e le maglie dei bambini. Certo che l'autunno e un bel periodo per pensare di lavorare a maglia dei cappelli! Ho visto quello disegno (dal libro giapponese Knitting Patterns Book 250) nella primavera, e pensavo di usarlo per un cappello. I went back to that hat project last week, but after a bit of swatching, I wasn't happy with the result, and returned to my Japanese stitch pattern books for more inspiration. I found the second stitch pattern in the same book as the first, and the final one in the book Knitting Patterns Book 300. 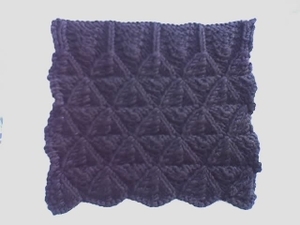 I imagined using the second one in a top-down design, so I then started figuring out a series of crown increases that would segue nicely into the main stitch pattern. Sono ritornata la settimana scorsa a quello progetto del cappello; pero', dopo un po' di swatching, non ero contenta, e sono tornata ai miei libri di modelli giapponesi per l'inspirazione. Ho trovato il disegno secondo nello stesso libro come il primo, e l'ultimo nel libro Knitting Patterns Book 300. Ho immaginato di usare il secondo in un modello top-down, quindi ho cominciato di calcolare gli aumenti, i quali progredirebbero nel disegno proprio. This turned out to be a several-days-long process! More on that later. Diventava un processo di parecchi giorni! Piu a piu tardi. As someone who doesn't use much variegated yarn, this specimen was interesting for me because the color is not a simple repeat; several strands of yarn which change colors at different rates have been twisted together, so that the overall color effect is ever-changing, with more heathered hues giving way to brighter sections. I personally would have been happier with a much narrower range of colors, such as those shown in these two snippets of the photo above. However, I didn't give up on finding a way to use this stuff: I then tried combining it with a solid color yarn, the idea being to "tame" all those rowdy colors. Perhaps it was largely the stitch pattern that left me saying "beh"*, but once again, running the entire ROYGBV gamut (this time with colorway #4 and a greenish instead of pinkish background) struck me as, I don't know, overly exuberant. The colors pictured below are quite muted compared to the real thing, by the way. As you can see from the photo below, I was still looking for a way to use those color changes in a vertical direction. Ho deciso di scrivere anche in Italiano, quando posso. Se parli Italiano (siamo tutti amici--o amiche-- qui, non avero?) meglio di me, ti prego, mi correggi. Anyway. Allora. O forse, Beh. It probably took about a week after I finished all of my projects for publication--did I ever say which publications? Two for Maternity Knits, one for the summer 2007 issue of Interweave Knits. A week of relief, and then I started itching to be designing something new. Unfortunately the Sherwood jumper for me, while still on the needles, and somewhat new, was not enough. Ci ha voluto (can you say that, in the past tense?) una settimana, e poi ho duvuto disegnare qualcosa di nuovo. So I started perusing my favorite stitch dictionaries--all of the stitch patterns in today's post are from Barbara Walker's A Treasury of Knitting Patterns--and sketching, and then swatching, and swatching some more. Well, Jeri, that is a very good question, and one which I had asked myself--and why doesn't Maple Seed swirl in the opposite direction, since it uses left-slanting decreases (SSKs) instead of right-slanting decreases (k2tog)? The stitch pattern for Beaufort originally caught my attention because it was so similar to one segment of Chinese Lace, and I had even MORE questions about the latter. Why do the first two segments, rows 1-4 and 5-8 on the chart, slant to the left, even though the YOs slant to the right, and the decreases slant both left and right? Why are the third and sixth segments, rows 9-12 and 21-24, essentially vertical, in spite of slanting YOs and decreases slanting both left and right? And why do the remaining segments, rows 13-16 and 17-20, slant to the right, even though the YOs slant to the left? Is it the proximity of YOs and decreases? 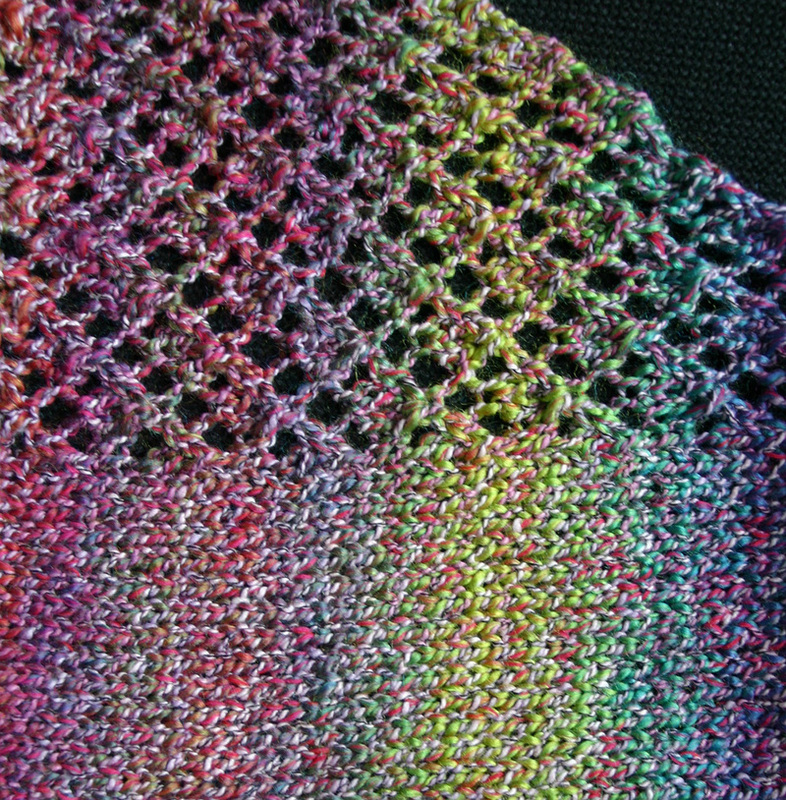 Well, I must admit that the main conclusion I had drawn from Chinese Lace was that the direction of decreases and the position of YOs does not always determine the slant of a stitch pattern--or lack thereof. And this was confirmed by my experience with Beaufort and Maple Seed. But to return to Jeri's question, there are two different kinds of swirls going on in these hats: one is the spiral at the crown, and the other is the diagonal that the stitch pattern creates, which would exist even if the knit fabric was flat. First, why does the stitch pattern spiral at the crown? I had noticed the same phenomenon in Grumperina's Odessa hat pattern. I know that I did nothing in the way of decreases to create the spiral at Beaufort's crown; in fact, I reworked those decreases a number of times, not only to create the most consistently decreasing shapes within the knit columns, but also to keep the natural spiral as smooth as possible. We've already noted that Beaufort's stitch pattern moves at an angle from the bottom edge--which is a circle, since it's a hat. If you picture a hat as a series of concentric circles, and the line crossing the circles at left shows the angle of B's stitch pattern, you can see that as the circles get smaller, and the line continues to cross each one at the SAME angle as the first, it begins to curve in a spiral. As for what causes that angle, if you look closely at the photo of Beaufort, you can see that the decreases for each 4-row pattern repeat form the shape of a triangle, (I'll call these the "decrease triangles", colored gray in the above diagram), while the corresponding YOs form--roughly-- an upside-down triangle that fits next to the first (white in the diagram; the purled areas are represented by the squiggly lines). Thus begins the Beaufort swirl, but what causes it to continue is that the left lower corner of each subsequent decrease triangle sits on the apex of the decrease triangle below, forming a diagonal line. Clear? Unclear? Agree? Disagree? The floor is open for discussion.